A Fun Spin...Or Two...Or Three! Memory Hardware: It's such a gorgeous, must-have, product-filled line by Frank Garcia! Included are fabulous rope chains; vintage effect Artisan Powders; beautiful trims with sequins, rosettes, and ruffles; exquisite glass pearls, a full range of metal accessories, handsome leather papers, the strongest ever Artisan Tapes...and the foundation of the line....Memory Hardware albums in every shape and size you'll ever need! Today Frank's design team is here to show off a variety of these amazingly versatile products...all spun together to create truly beautiful pieces! You better buckle up because these gals went ALL-OUT this month! "The Memory Hardware collection is bursting with fun, unique, and rich products. 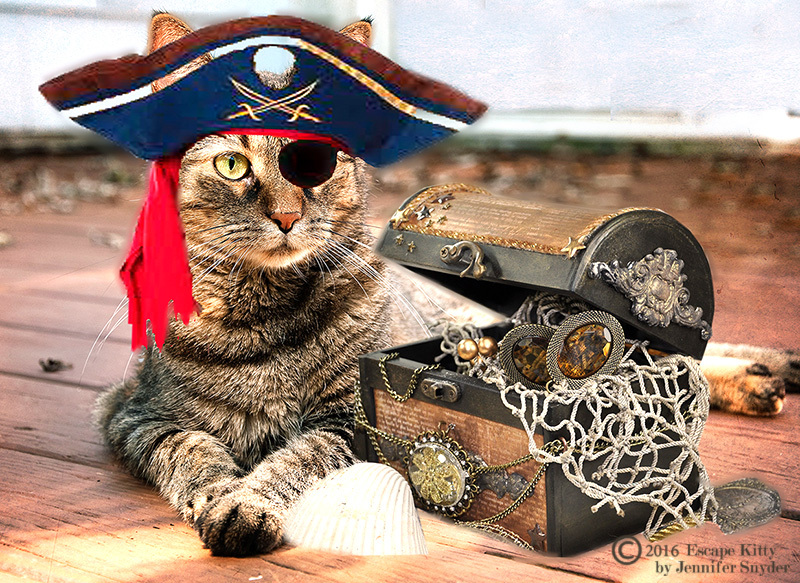 What could be more rich than a pirate's treasure chest filled with Memory Hardware chains and trinkets? I had a lot of fun with this piece, utilizing so many wonderful items from the line. I love it. I actually have a FULL tutorial on my blog showing exactly how I used the hardware...like this fun little tip for trinkets and lace trim here!" " ~ Jennifer Snyder"
Jennifer's post is literally filled with how-tos and great step-outs so be sure and check it out. "I love to layer. That's my thing. You won't really find me doing lighter papers with lots of paints and misting work to make my own background as is the trend these days. I enjoy the pattern of paper and love contrast. I add my interest by using lots of layers, mixing patterns, and finding unique ways to use the embellishments. I especially adore the LaVie Antique Cloche. I rubbed off the word that was on it and embossed the metal portion. I simply cut out the Tales of Us from one of the papers to place underneath it." "I'm not one to use embellishments as they come packaged. I broke the latch apart and used one piece on the envelope flap and the other on the photo. Both were embossed and painted for a grungy worn look." - See more details of this stunning project on Lisa's blog right here! She makes creating layouts with a mixed-media spin so FUN and interesting! Lisa Gregory's gorgeous mini-album has so many techniques included! She is seriously filled with tips for using Memory Hardware products. We're so thankful she shared a few with us from her mini. See if you can spot three different ways she used the Artisan Powders! Mix the Artisan Powder with Art Basics - Soft Matte Gel to form a translucent paint to prepare your chipboard journal. The result looks like wood. Once your papers are adhered to the journal, dry brush the powder around the edges of the paper to blend it into the chipboard. Mix Artisan Powder with water and use it to stain ribbon or seam binding. Prima the Apothecary Vial with Art Basic White gesso. Let it dry. Then mix Artisan Powder with water and drip it onto the bottle. Lisa G, Jennifer, and Lisa N...we are so blessed to have you share your time and talent with us today! Thank you from everyone at Prima! Aren't these gals uber-talented? We'd love for YOU to share your talent with us as well. Join us on our social media (links below) and join in Frank's Facebook group! They'll welcome you, and your Memory Hardware projects, with open arms! Ohhhhhhh gasp - I love seeing what my teammates create - the gorgeousness and amazing techniques. And I'm cracking up....Escape Kitty the Pirate makes her Prima Debut. Thanks Sharon. Great projects! So many wonderful goodies in the Memory Hardware line! Oh my my..Prima Memory Hardware is something special!!! And the designers are simply FABULOUS!! Each and every project is absolutely wonderful each and every time!! Thank You Sharon!! Gorgeous work Ladies! Thank you for the beautiful blog post Sharon! LOVE these!! Especially Jennifer's pirate chest!!! I love the Memory Hardware collection and use it often!!! TFS!